352 pages | 31 Color Illus. Social identity research is very much on the ascendancy, particularly in the field of organizational psychology. Reflecting this fact, this volume contains chapters from researchers at the cutting edge of these developments. Section 1: Introduction. 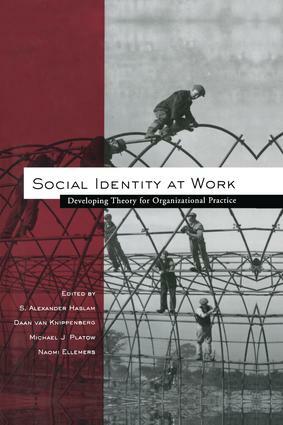 N. Ellemers, S.A. Haslam, M. Platow, D. van Knippenberg, Social Identity at Work: Developments, Debates, Directions. Section 2: Motivation and Performance. D. van Knippenberg, N. Ellemers, Social Identity and Group Performance: Identification as the Key to Collective Effort. J. Wegge, S.A. Haslam, Social Identity, Self-categorization and Group Goal Setting: Engaging the Collective Self to Enhance Organizational Outcomes. D. van Knippenberg, S.A. Haslam, Harnessing the Diversity Dividend: Exploring the Subtle Interplay between Identity, Ideology and Reality. Section 3: Communication and Decision-making. T. Postmes, A Social Identity Approach to Communication in Organizations. M. Lea, R. Spears, P. Rogers, Social Processes in Electronic Team Work: The Central Issue of Identity. M. Turner, A. Pratkanis, T. Samuels, Identity Metamorphosis and Groupthink Prevention: Examining Intel's Departure from the DRAM Industry. Section 4: Leadership and Authority. M. Hogg, R. Martin, Social Identity Analysis of Leader-member Relations: Reconciling Self-categorization and Leader-member Exchange Theories of Leadership. H. Smith, Y. Huo, T. Tyler, Interpersonal Treatment, Social Identity and Organizational Behavior. K. Reynolds, M. Platow, Why Power in Organizations Really Should be Shared: Understanding Power through the Perils of Powerlessness. Section 5: Change and Change Management. N. Ellemers, Identity, Culture, and Change in Organizations: A Social Identity Analysis and Three Illustrative Cases. E. van Leeuwen, D. van Knippenberg, Organizational Identification Following a Merger: The Importance of Agreeing to Differ. D. Terry, A Social Identity Perspective on Organizational Mergers: The Role of Group Status, Permeability, and Similarity. R.A. Eggins, K.J. Reynolds, S.A. Haslam, Working with Identities: The ASPIRe Model of Organisational Planning, Negotiation and Development. Section 6: Perceiving and Responding to Inequity. M.J. Platow, M. Wenzel, M. Nolan, Setting Fairness within a Community: The Importance of Intragroup and Intergroup Dynamics on Creating and Responding to Fairness. M.T. Schmitt, N. Ellemers, N.R. Branscombe, Perceiving and Responding to Gender Discrimination at Work. S.A. Haslam, N. Branscombe, S. Bachmann, Why Consumers Rebel: Social Identity and the Aetiology of Adverse Reactions to Service Failure. References. Subject Index. Author Index.